Taken literally, air conditioning includes the cooling and heating of air, cleaning and controlling its moisture level as well as conditioning it to provide maximum indoor comfort. An air conditioner transfers heat from the inside of a building, where it is not wanted, to the outside. Refrigerant in the system absorbs the excess heat and is then pumped through a closed system of piping to an outside coil. A fan blows outside air over the hot coil, transferring heat from the refrigerant to the outdoor air. Because the heat is removed from the indoor air, the indoor area is cooled. 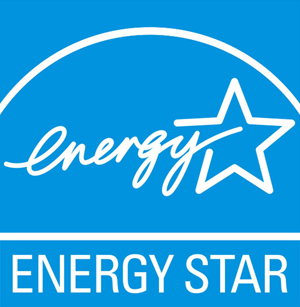 Most central air conditioning systems include a “hot” side, outside your home, and a “cool” side, inside your home. 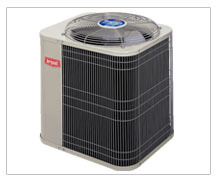 The “hot” side generally consists of a condensing coil, a compressor and a fan. The “cool” side is usually located within your furnace. The furnace blows air through an evaporator coil, which cools the air, and routes this cool air throughout your home using a series of air ducts. The cleaning function of air conditioners is performed by filters, which remove dust and contaminants from the air. In some systems, the filters are permanent and can be washed periodically to remove accumulated dirt. Most systems have disposable filters which can be replaced. When filters become clogged, they restrict the flow of air and cause the system to operate inefficiently. 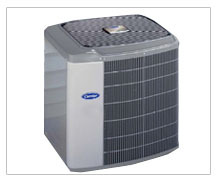 A heat pump is like a conventional air conditioner except it also can provide heat in the winter. 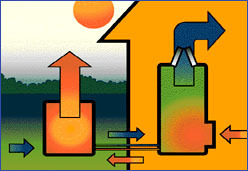 In the summer, the heat pump collects heat from the house and expels it outside. In the winter, the heat pump extracts heat from the outside air and circulates it inside the house. The heat pump works best when the outdoor temperature is above freezing. Below that, supplementary heat often is needed. 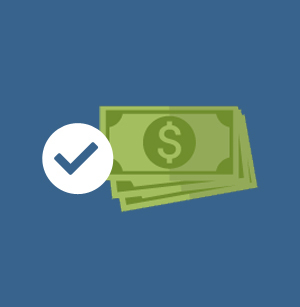 A heat pump can save 30 to 60 percent less energy to supply the same heat when compared to an electric furnace with a resistance heating element. Refrigerant passes through the indoor coil, evaporating from a liquid to a vapor. As the liquid evaporates, it absorbs heat, cooling the air around the coil. An indoor fan pushes this cooled air through ducts inside the house. Meanwhile, the vaporized refrigerant laden with heat, passes through a compressor which compresses the vapor, raising it’s temperature and pressure. The reversing valve directs the flow of hot, high pressure vapor to the outdoor coil where the heat released during condensation is fanned into the outdoor air, and the cycle begins again. During the heating cycle the refrigerant flows in reverse. Liquid refrigerant now flows to the outdoor coil picking up heat as it evaporates into a low pressure vapor. The vapor travels through the compressor where it is compressed into a hot, high pressure vapor, then is directed by the reversing valve to the indoor coil. Then vapor turns into liquid as it passes through the indoor coil, releasing heat that is pushed through the ducts by the indoor fan.